Infiniti was established in 1989 as the luxury brand of Nissan. Infiniti is a well-regarded brand that competes directly with Toyota’s and Honda’s luxury brands, Lexus and Acura. Infiniti’s debut model was the full-sized luxury sedan, the Q45, which was discontinued in 2006. Since then, Infiniti has broadened its model lines and expanded into the SUV, Sports Car, Mid-Sized and Crossover markets with its respective series: QX is the SUV line, G is the Sedan and Coupe line, M is for their Mid-sized class, and FX is the Crossover series. Santa Rosa Transmission and Car Care’s mechanics are experts with Infinitis and are certified to work on the older, as well as the newer Infiniti models. For an appointment, contact Santa Rosa Transmission and Car Care at 707-766-0750 or drop by our location at 1015 Santa Rosa Avenue, Santa Rosa, CA 95404 for a quick look at your Infiniti. 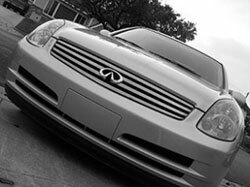 At Santa Rosa Transmission and Car Care, we’ll be happy to assist you and take excellent care of your Infiniti so it can take care of you.